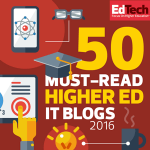 Thank you to the folks at EdTech Magazine for including me once again in their list of 50 must-read higher ed IT bloggers. And thanks, also, for placing me in the “tech guru” category with very smart folks like Bryan Alexander, who speaks much more eloquently on the future of IT and higher ed than I do. It’s hard to believe I’ve been doing this for eight years. I’ve learned so much, and it’s fun to share that knowledge with all of you. Next Next post: Can Amazon Take On and Beat YouTube?